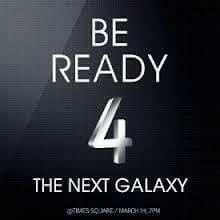 After months of speculations, build up and excitement, fans and reporters gathered at Radio City Music Hall in New York last night to take part in the launch of the Samsung Galaxy S4. In such a competitive market to have the best smartphone and gain the marketshare, HTC gathered a street team to embark on the crowd and give out snacks and hot chocolate as they waited in line to enter the building. As well the street team was savvy enough to show off HTC’s new flagship product the HTC One which was launched a few weeks ago. Another rival, LG also tried to grab some attention by using the billboard at Times Square, with a slightly different message that also played off Samsung’s use of the number 4 in their messaging.